I don't normally do the cut and paste thing, but I received this press release today from Runner's World and I couldn't have said it better, so here ya go! EMMAUS, PA (June 30, 2014) -- Runner’s World, the largest and most influential media brand in the running space, has signed a partnership with Spartan Race™, the global leader in obstacle racing since 2005, that includes custom digital content, racer-focused benefits, training plans and event activations. The collaboration between these two premier fitness brands kicked off in the July issue of Runner’s World magazine, which reaches over three million people monthly in print. Highlights of Runner’s World’s involvement in Spartan Race events include: Customized Spartan Race training plans designed by Runner’s World experts as well as exclusive stories and videos to be available only on Spartan.com; Runner’s World content on Spartan.com; and a Runner’s World presence at select Spartan Race events. According to a Running USA Study, in just five years, the number of estimated finishers in non-traditional events has grown from low six figures in 2009 to four million in 2013, a nearly 40-fold increase. “We’re excited to kick-off the partnership with Runner’s World,” said Colby Connell, Spartan Race’s Vice President of Marketing. “Our goal is to expand the way people view health and fitness. While we provide people with an alternative to more traditional running events, Spartan Race is still a race at the end of the day and our heritage comes out of distance running. “We believe that Runner’s World’s knowledge of training, nutrition, and race day preparation will greatly help our current race community. We also believe the alliance will help educate those in the traditional road race and trail running communities on how to optimally train for a Spartan Race. Labels: Runner's World Spartan races! Did you all have a fabulous weekend. The weather was just beautiful here. Was it beautiful where you live too? I got a very fun package in the mail on Saturday! 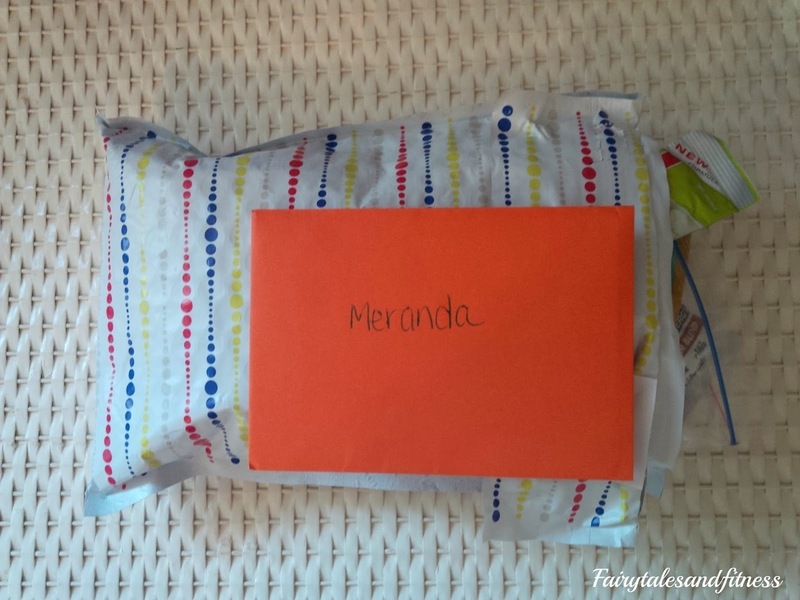 I won a giveaway from Alicia at In Healthy Habits We Trust! Alicia's is having some dietary issues that she is trying to work through. 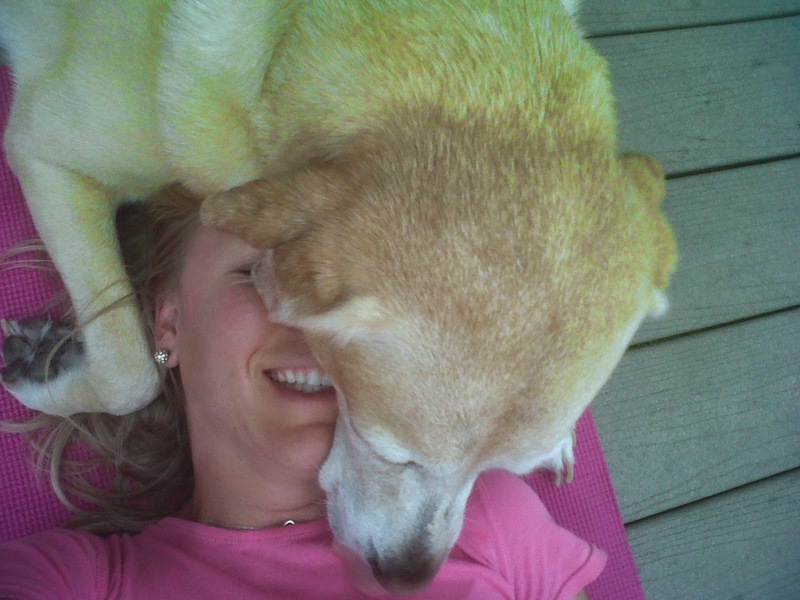 In the process, she has found that she can no longer tolerate certain energy gels and running fuels. 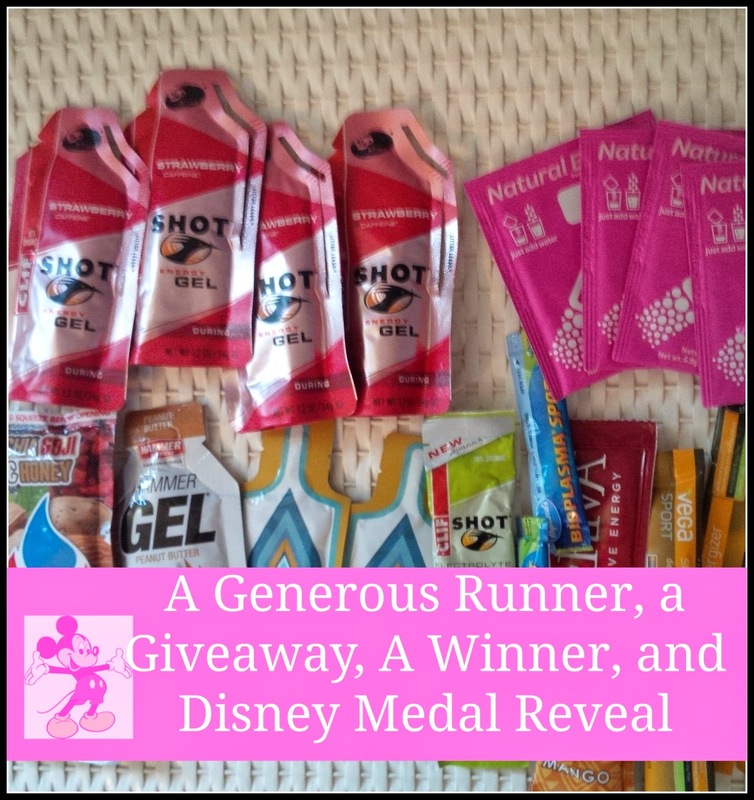 Because of this, she was generous enough to host a giveaway for all the products that she can no longer use in hopes that another runner can use them. I was the lucky runner who won them! I loved the fun packaging and the thoughtful card. This is the loot she sent me! 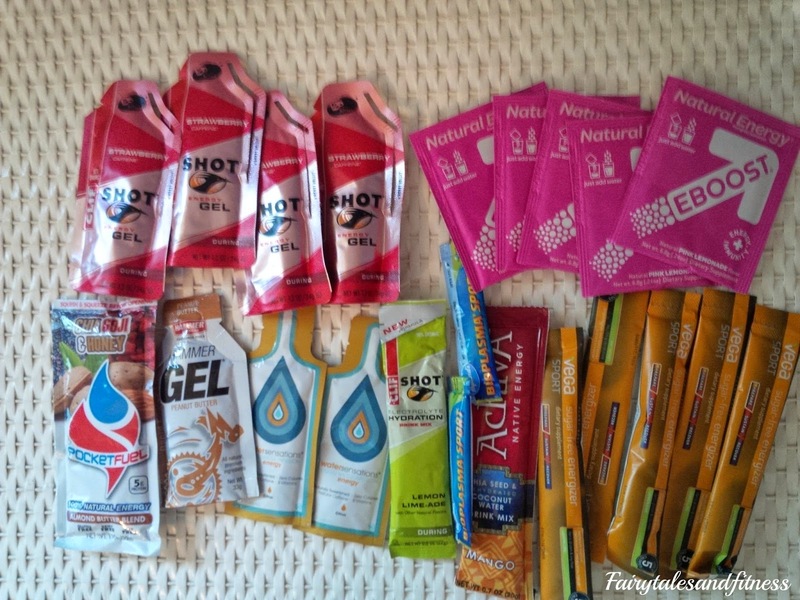 I can add it to my basket of running goodies. That's right. 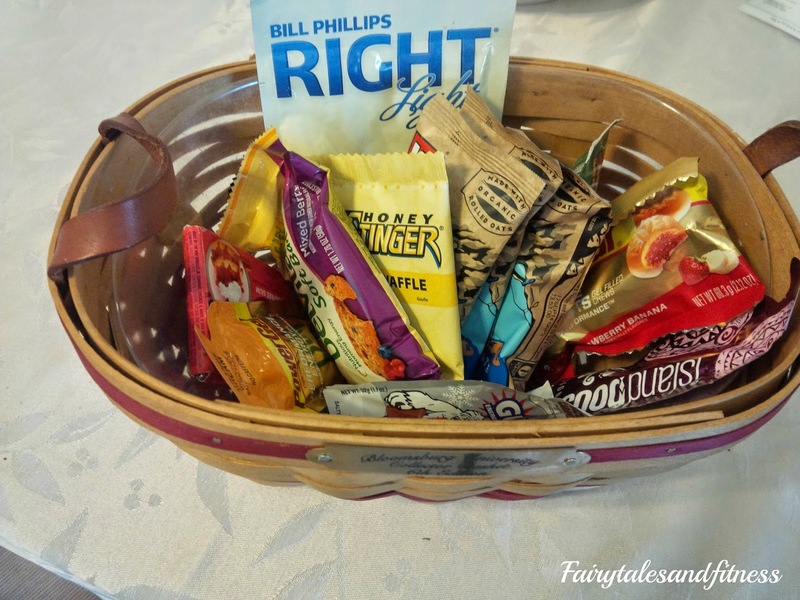 I have a basket of running snacks that I only use for a treat on the days that I run. Its good motivation! The other day I was at the store and I got some Clif bars for .70 cents each! That just made my day! Okay, so do you remember that we were doing a giveaway for a Flip Belt? Amy Please contact us for your prize! And one more things I wanted to announce on this Monday. I'm not normally one who wants to know what the medals look like for a race. I actually like the element of surprise. I just happened to see on social media this weekend the medals for Disney's Tower of Terror weekend. The TOT medal is basically the same as previous years but I have to say that the Happy Haunted 5K medal is just awful and I am a tad disappointed. I was hoping for a medallion like previous years with a cute Mickey and Minnie on it dressed in their Halloween costumes! 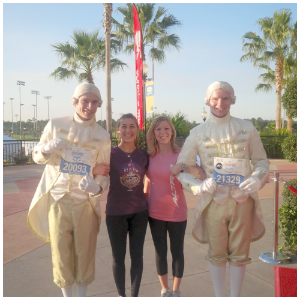 I can't tell completely what the 5k medal is, but it looks like the hitchhiking ghosts! What do you think of the TOT weekend of medals? 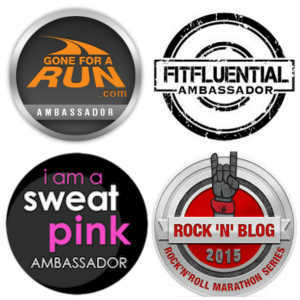 Will you be running any races that weekend? Hey Guys, Lacey was pretty busy with work this past week so I don't really have much of a peek into what she had done. I know that she flew into Milwaukee for one of the trips and she also spent some time in Columbia, SC where she got to meet up with one of our friends. I'll keep what I did pretty brief this week too. Remember I said last week I was working on a landscaping project with my parents? well this week I did a lot of the same. Monday /22: I got Scott to run/walk with me on my favorite trail on the Island. Tuesday/23: I ran 4 miles this day. This was a very proud 4 miles! This was the longest distance I had been able to run PAIN FREE since my injury. 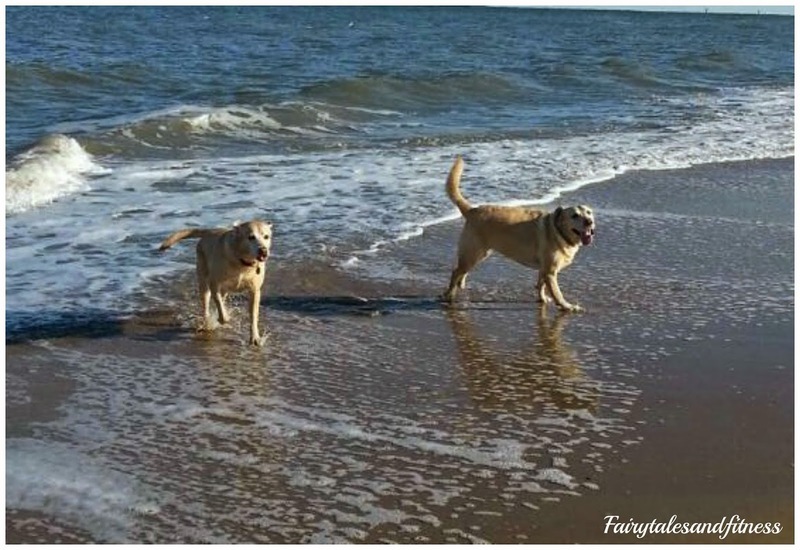 ( I did do the 11K April Fools race back in April, but it certainly was not pain free!) I was also trying a new pair of shoes that I got from a running seminar last Friday. I wasn't loving them and I could tell I was starting to get blisters on the top of my toes. I was going to give them another chance on another run, but decided against it. I figured 4 miles was long enough to know if I loved them or not. 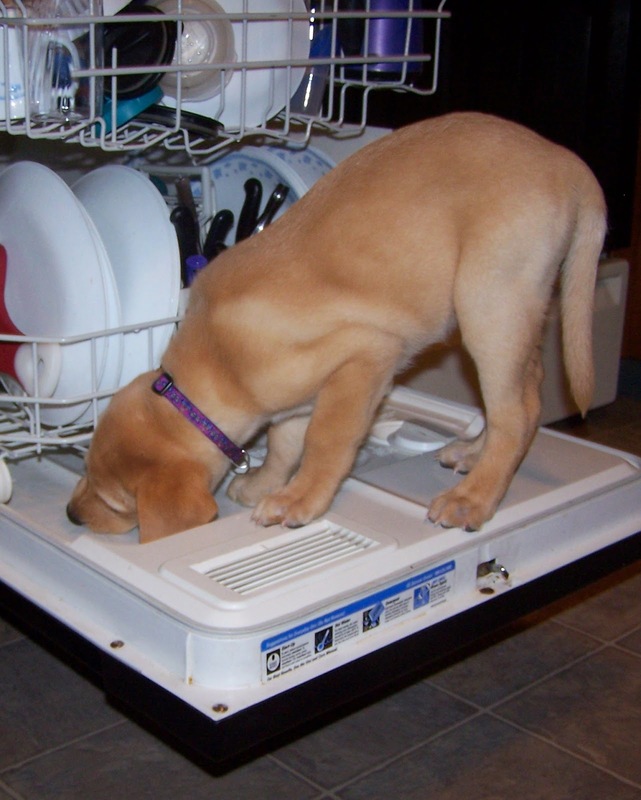 Besides, I didn't want to get them too dirty. I promptly returned them to the running store the next day. Wednesday and Thursday I did nothing eventful. Friday/27: I was going to do another 4 miles today but remembered I was going to mow the lawn when I got home ( and still had to do the neighbors lawn as well since they were out of town). I didn't want to be as exhausted as I was last week, so I only did 3.1. I was still exhausted when I got done with the lawn. Our town started the 4th of July festivities this weekend so we went to watch the fireworks this night! Saturday/28: I went to the town's fourth of July parade to take pictures for my job. It was fun seeing all the war veterans go by in the cars and I got to see my own Pappy! I was also required to go to a birthday celebration for a lady in town that was turning 100 years old! How amazing it was to meet someone that is 100! 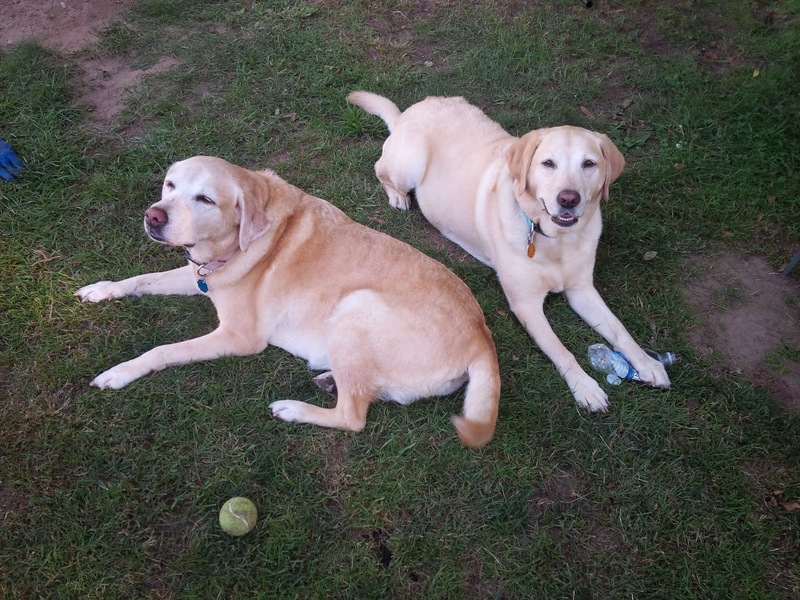 Scott got a new Garmin last week, so we are hoping to go for a little trail run/walk when it cools down tonight! 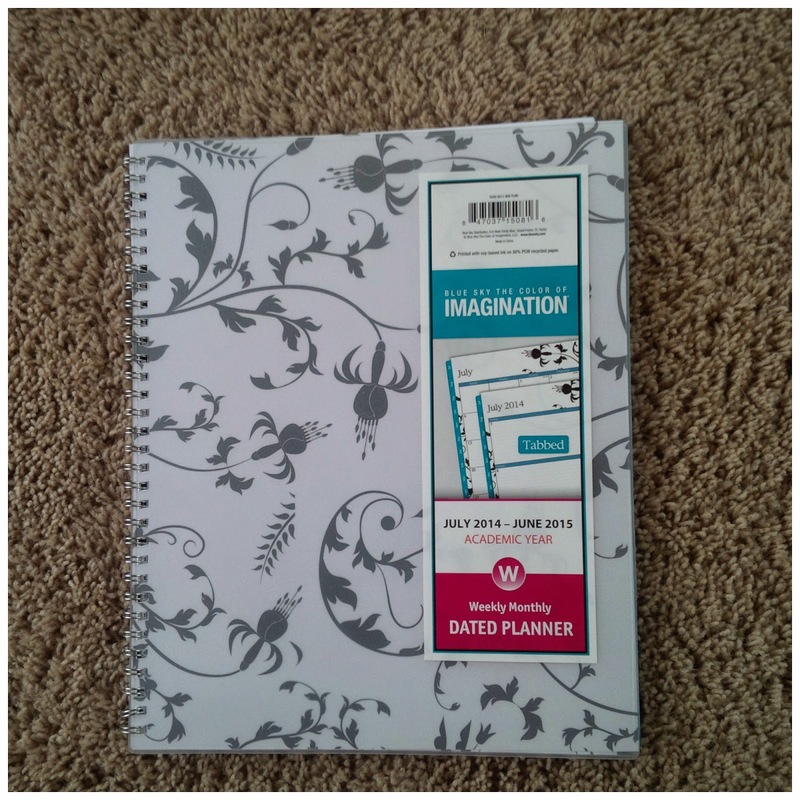 Yes, it is a planner. If you follow me on twitter you may have heard me mention that I was on the look for one. I've been looking for one for over a month and couldn't find one anywhere. I figured the years was half way over anyway, so I probably wouldn't have much luck unless I bought one of the Franklin Covey's with the refillable pages. 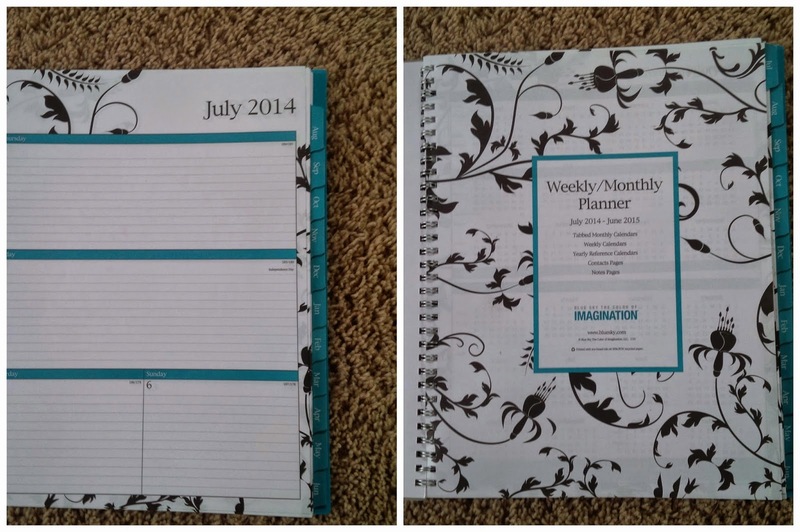 But check this out, this planner even starts out with the month of JULY and runs till next June. I guess it's an academic planner. Everyone always asks me why I don't just use my phone for reminders. I'm a old fashion pen and paper gal! I have so many dates and deadlines I have to remember that this is just easier for me to keep track of. I've already started to write things down and my brain feels so much happier! And one thing I am looking forward to this week is my ortho appointment. YAY, finally. I made this appointment over 2 months ago and I thought July 2 would never get here! I've never been so excited to go to a doctor appointment before! Tell me, what was the best thing that happened to you last week? How do you keep track of important dates and deadlines? Happy Friday Folks! 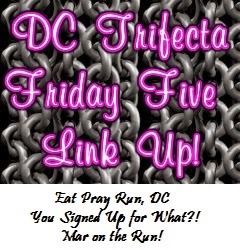 We are linking up with the gals again ( Courtney, Mar, and Cynthia) for the Friday Five and this week's theme is "About Me". You may have remembered earlier this month we did a post about us. If you didn't get to read it and you want to know a little more about us and all of our secrets, you can read that HERE. 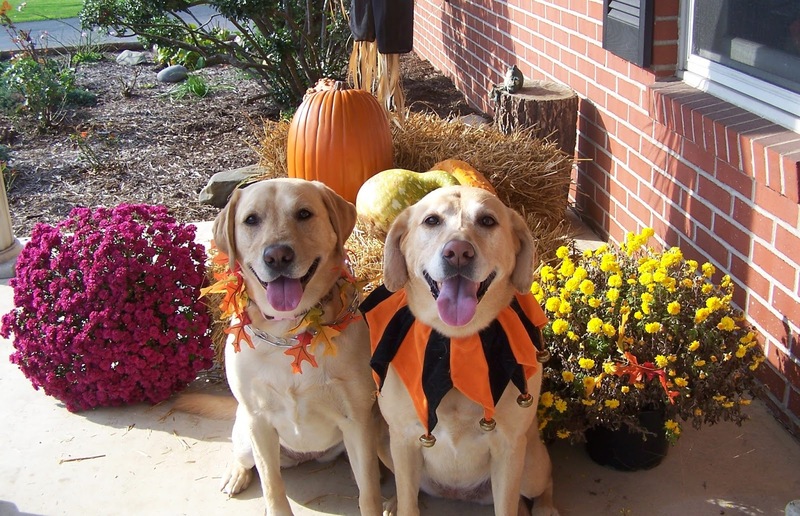 For this post, we are going feature something that is a huge part of our lives.....Our Labradors. 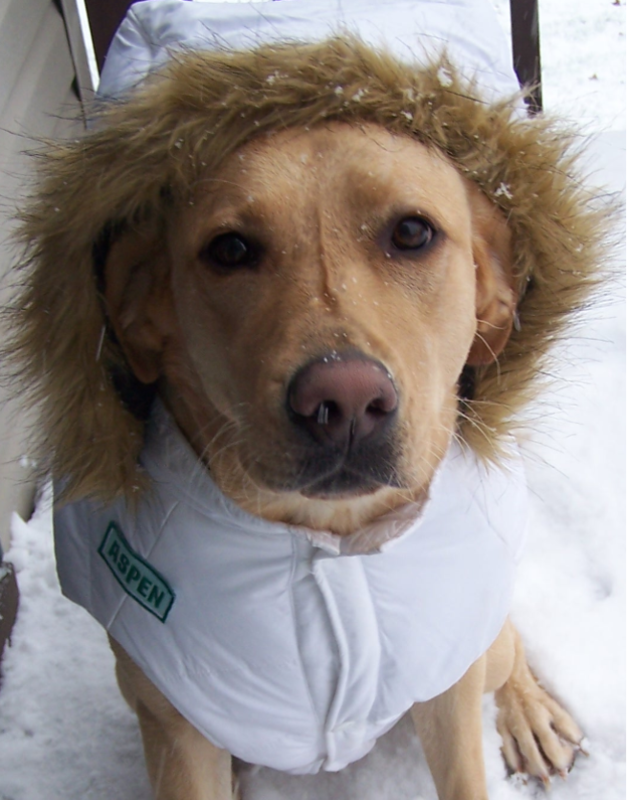 Yes, we think our Labradors are human. They act like it. 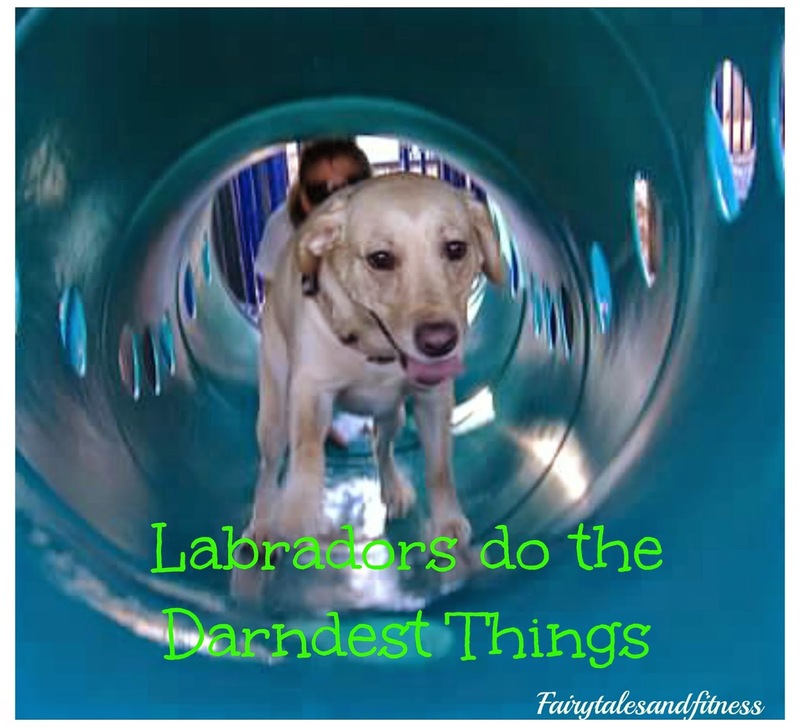 And truth be told, they are better behaved than some children we've encountered! I kid ( kind of). 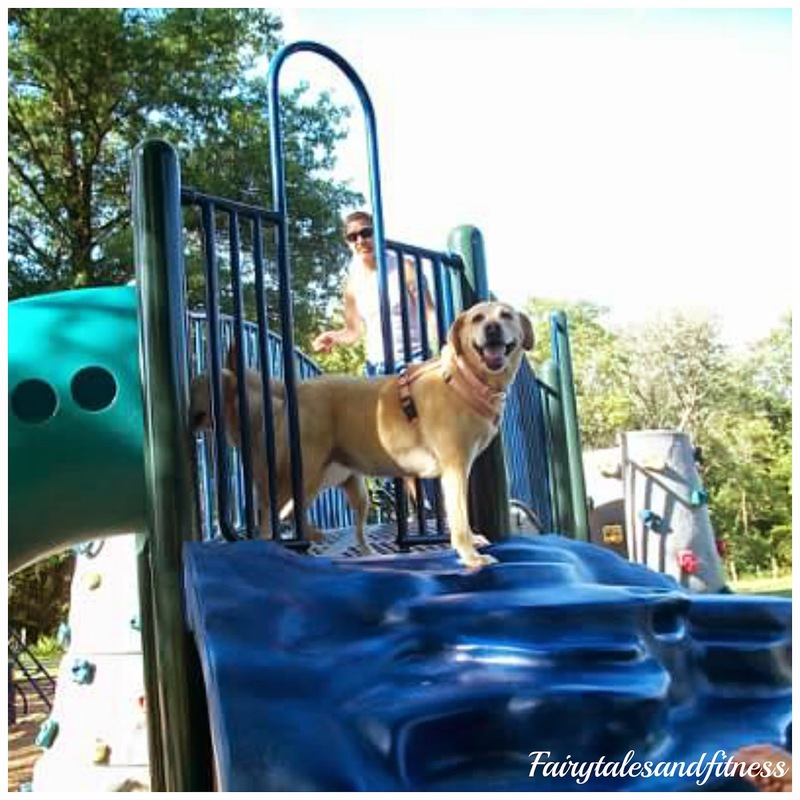 Whether they are real vacations to the beach or just day trips to the playground or amusement park, they certainly know how to have fun! 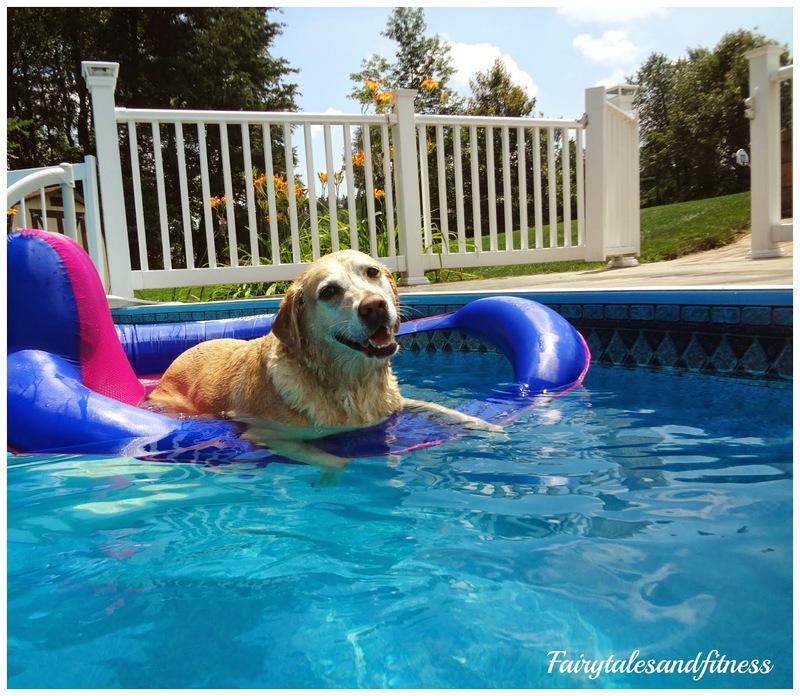 This dog has her own raft and I swear to goodness she will pull it into the swimming pool all by herself, walk down the steps, get herself on the raft, and float. When she is done, she will get off the raft and pull it out of the pool. Don't believe me? I actually have a video of her doing it. 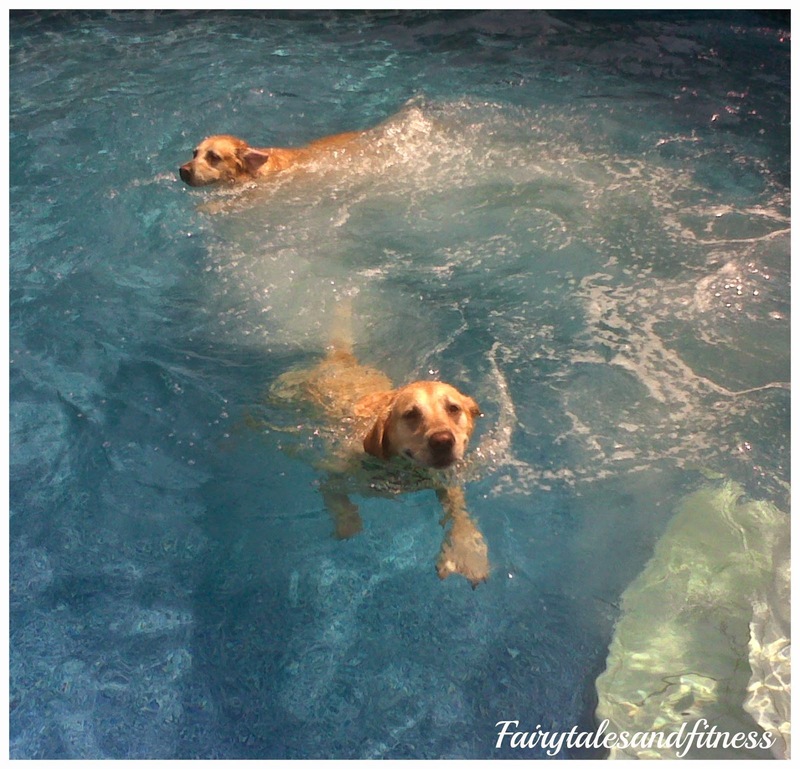 And when they are not swimming, they find other ways to be in water. 3. 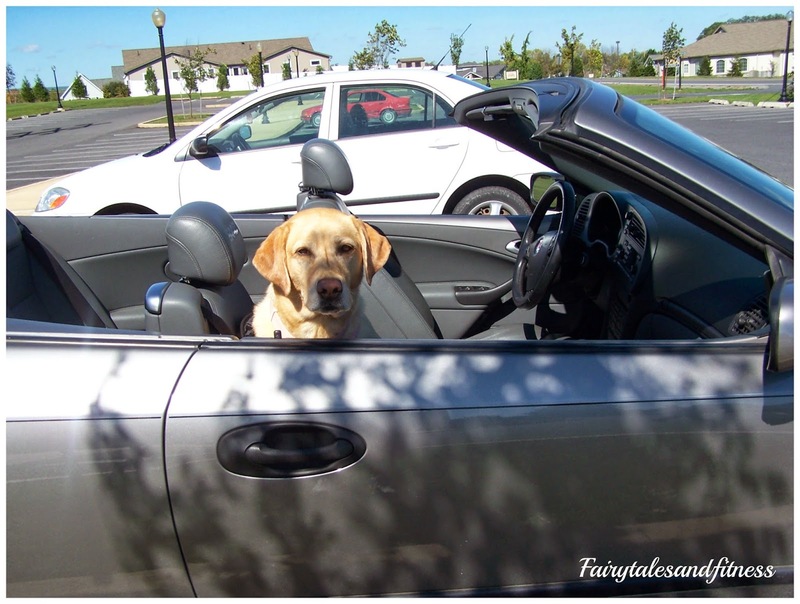 Did someone say car ride? I take Baylee with me a lot of places so naturally every time I walk out the door she thinks she is coming with me. I get such sad eyes from her when I tell her she has to stay home. But she waits for me patiently. 5. And since this IS mostly a Fitness blog I guess we'll show this picture too. 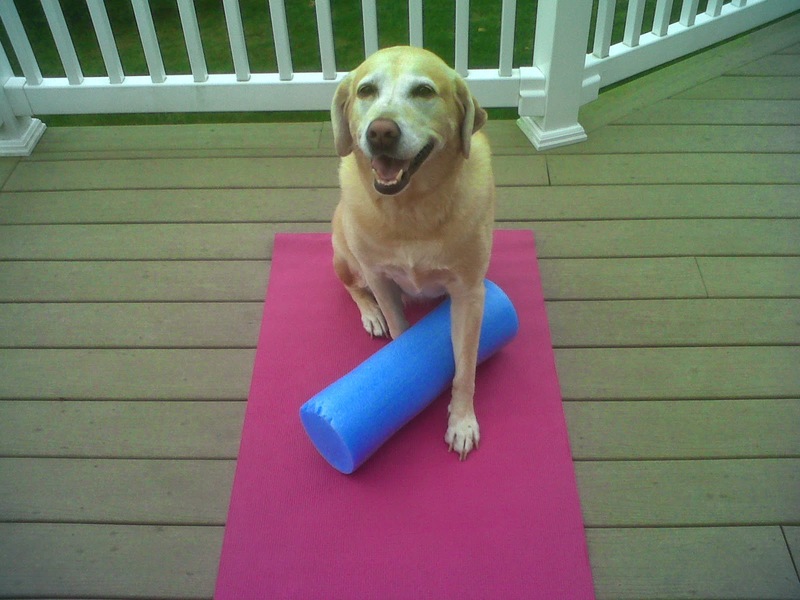 She just can't seem to let me on the yoga mat by myself. She always has to be a part of what I am doing. Buts that's okay because I wouldn't want to be with out her anyway! Are you a pet person? 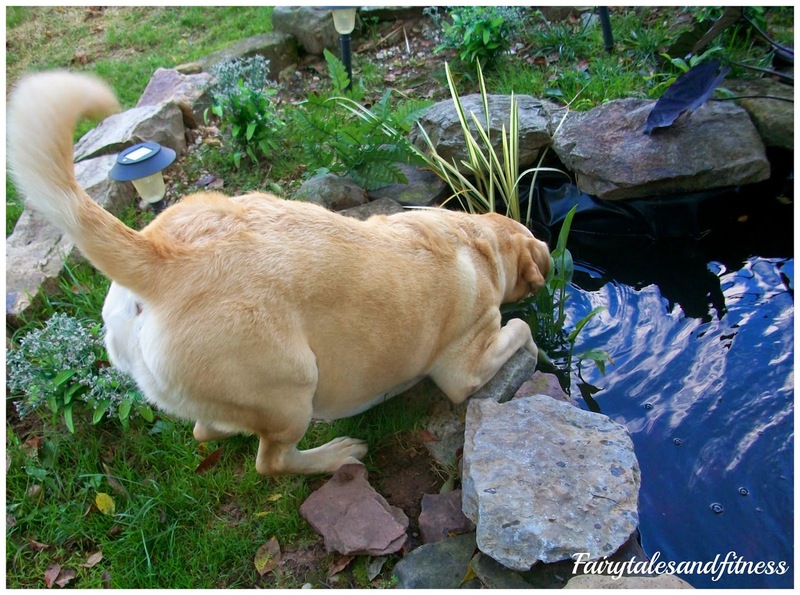 Do your pets do crazy things? Our next trip to Disney isn't until October when we go for TOT weekend, but I sort of wish we were going this summer to because the characters from Frozen will now be in Hollywood studios! 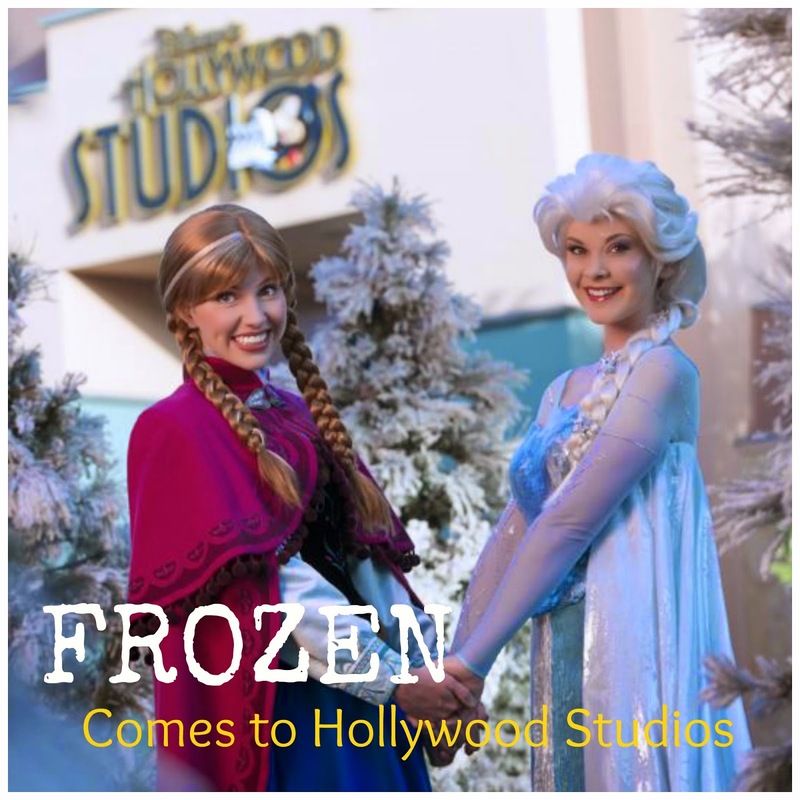 The event is called "Frozen Summer Fun: Live at Disney's Hollywood Studios". It starts July 5th and runs through September 1st! With regular park admission guest can experience a wide range of "Frozen' entertainment. This sounds like great Summer fun but I wish they would keep this event running through the winter season. it might be a fun way to get into the winter/holiday spirit don't you think? Will you be heading to Disney during this time? 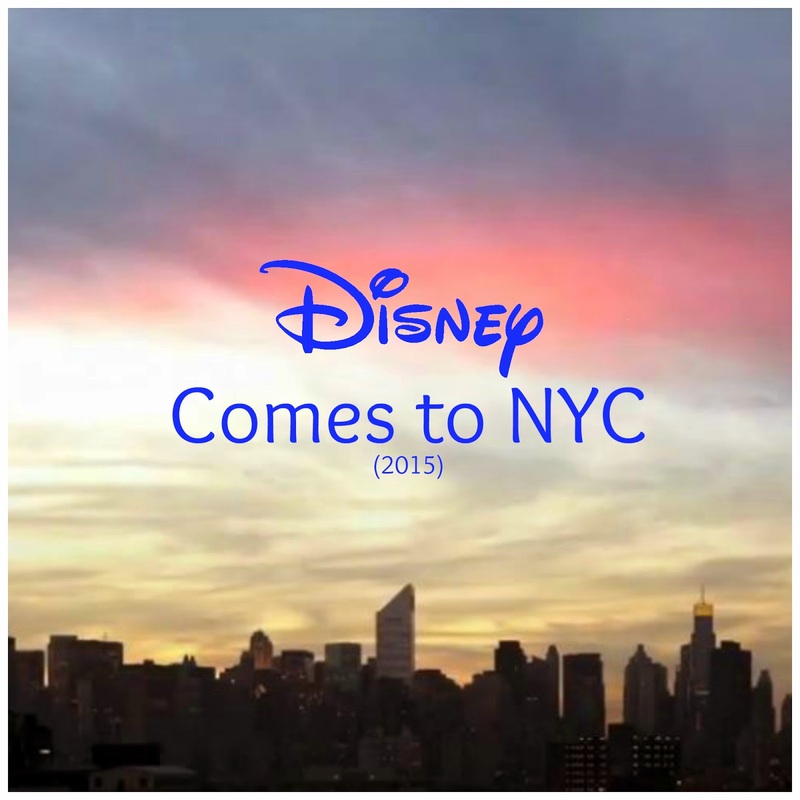 This just in....Disney is coming to New York City. I was very excited to hear that Adventures by Disney is now offering long weekend trips to the Big Apple in 2015! The package includes 4 days in New York City, meals at exciting restaurants, and experiencing some really cool stuff in the city like Broadway shows and guess what else? Visiting the Studios of Good Morning America! Isn't that exciting? I love Broadway shows and all, but I would be super excited to visit the set of Good morning America. I think this is something that I would be interested in doing. How about you? Have you ever been to NYC before? Do you live in NYC? 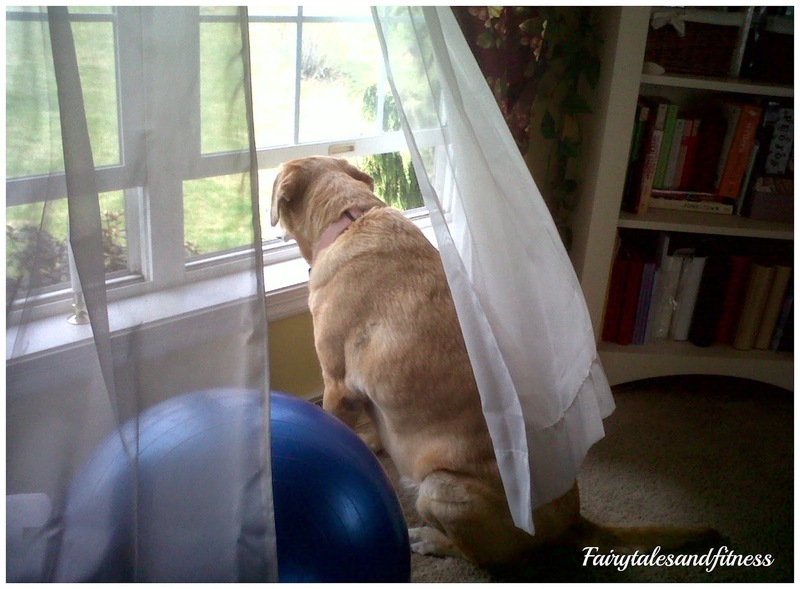 Today we thought we would mix things up a bit and participate in the Wordless Wednesday Photo hop with Focused on the Magic. Today's theme is XYZ. To say that finding pictures that started with these letters was difficult was an understatement but here is what we came up with. X is for eXcitement. Looks like we were quite excited here. I guess we could have used Y for this picture for Young too. Look how young we are. This trip was actually in celebration of college graduation! 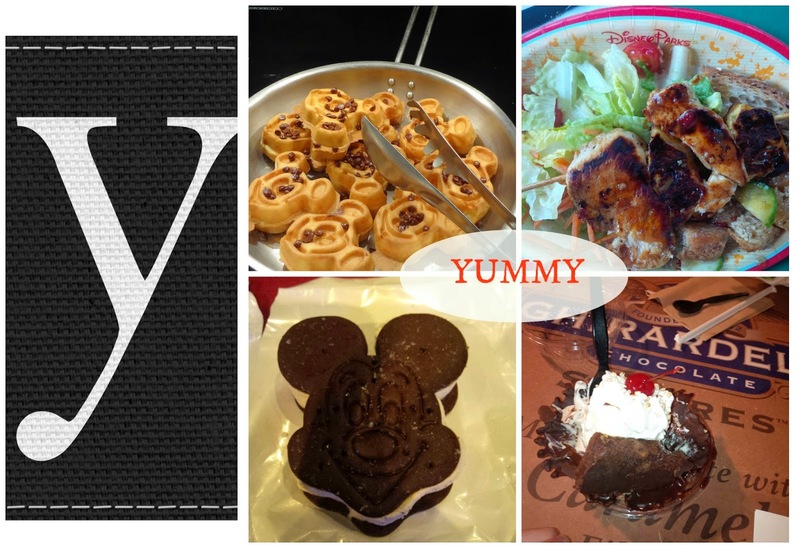 Y is for YUMMY! There aren't too many items at Disney that aren't yummy! 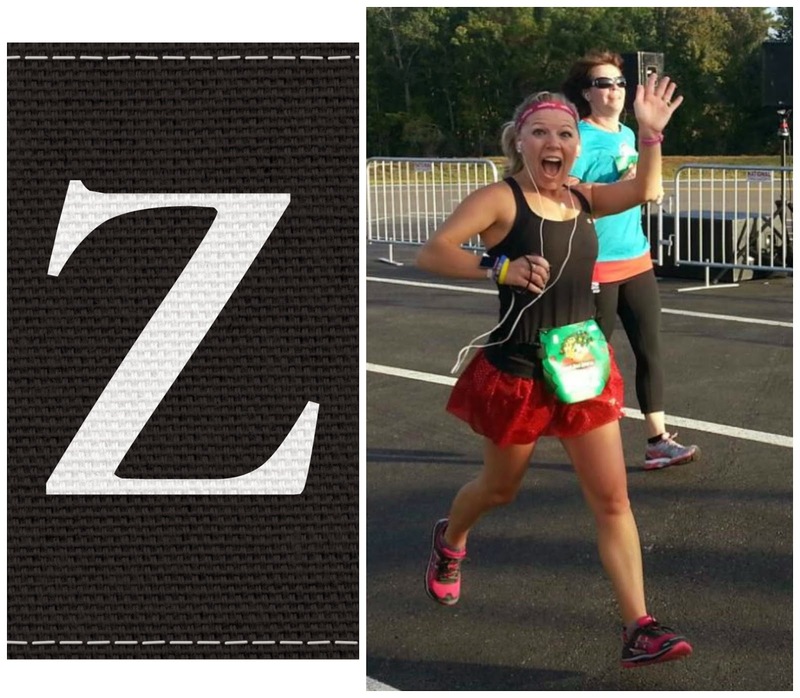 Z is for ZIPPY! This photo was taken as I was finishing up Mickey's Jingle Jungle 5K last November. I certainly was feeling very Zippy at that point! 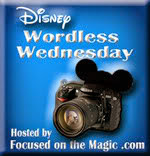 That's it for this Wordless Wednesday. 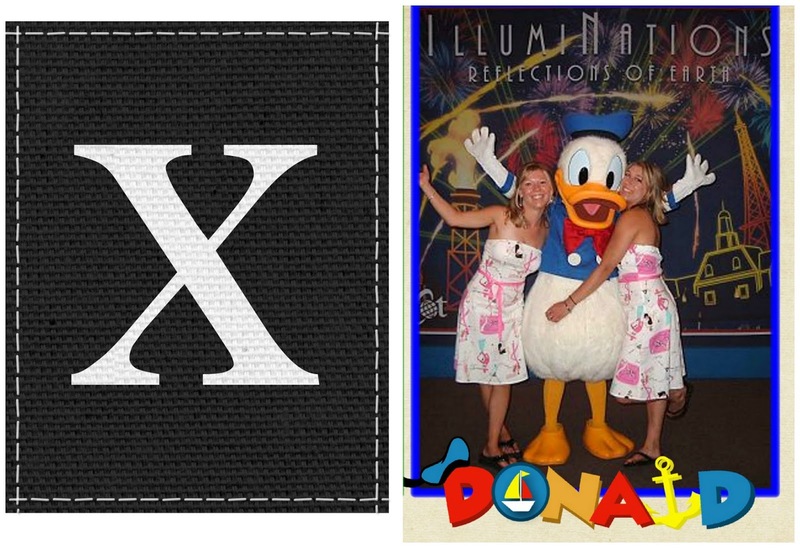 What Disney or vacation words/pictures would you come up with for the letters XYZ? Do you think my Asparagus Salad will make it to the Cookbook? When I go to summer picnics, a lot of the side dishes are potato salad, macaroni salad and various types of pasta salads. One thing that I've notice is that a lot of these salads are very starchy. That's when I set out to make a salad of my own ( that didn't include any pasta or potatoes). I call this Asparagus Salad. I love steamed asparagus in the summer time and I love putting it on the grill too! In this recipe I steamed it but I suppose you could grill it if you wish. 1. Clean and snip ends of asparagus as usual. 3. Cut each asparagus stalk into thirds. 5. Cut up tomato, cucumbers, and black olives and add to mixing bowl. 6. Toss in Balsamic Vinaigrette. I came up with this recipe last summer and when I take it to picnics I get so many compliments on it. 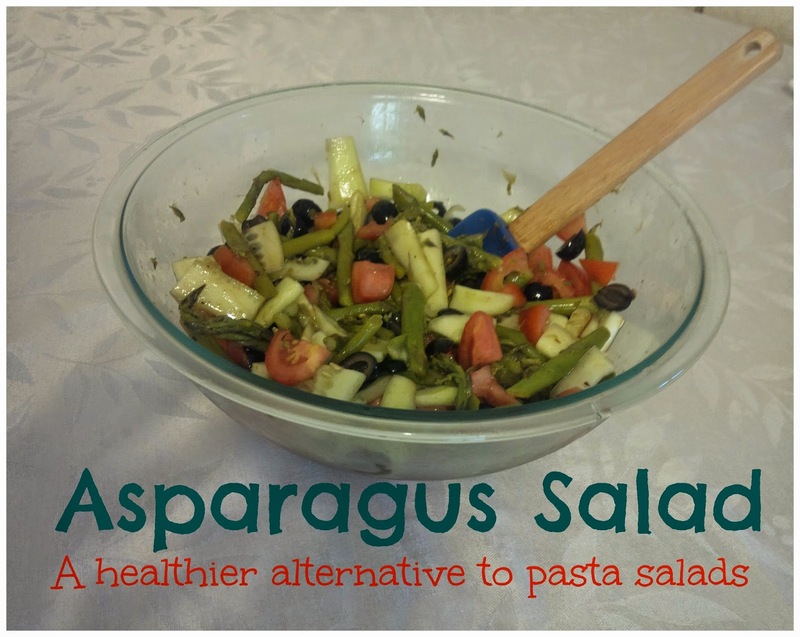 It is a great alternative to the traditional Macaroni on Pasta salads. Since this recipe is my original creation, I am going to submit it to the Fit Approach recipe contest for their cookbook. Do you think it has a chance of getting accepted? What are some of your alternative salad dishes? Well, I guess we are officially into Summer. Wasn't June 21 suppose to be the longest day of the year? That night Scott and I were sitting out on our back patio discussing this and we saw a shooting star! It was amazing and I can't believe we saw it in that split second. It wasn't the first one that I've seen, but for some reason they are always special. Since it is "officially" hot outside it can sometimes make running a little uncomfortable if I don't get out on the trail by a certain time. I do like to get up early, but I admit that sometimes I don't get up and around early enough. It can be sweltering hot here by 8 am. I can remember being just miserable last year because my favorite trail was so hot because it had very little shade on it. Since then I had gone to look for some other places to run where I would be out of the direct sun. 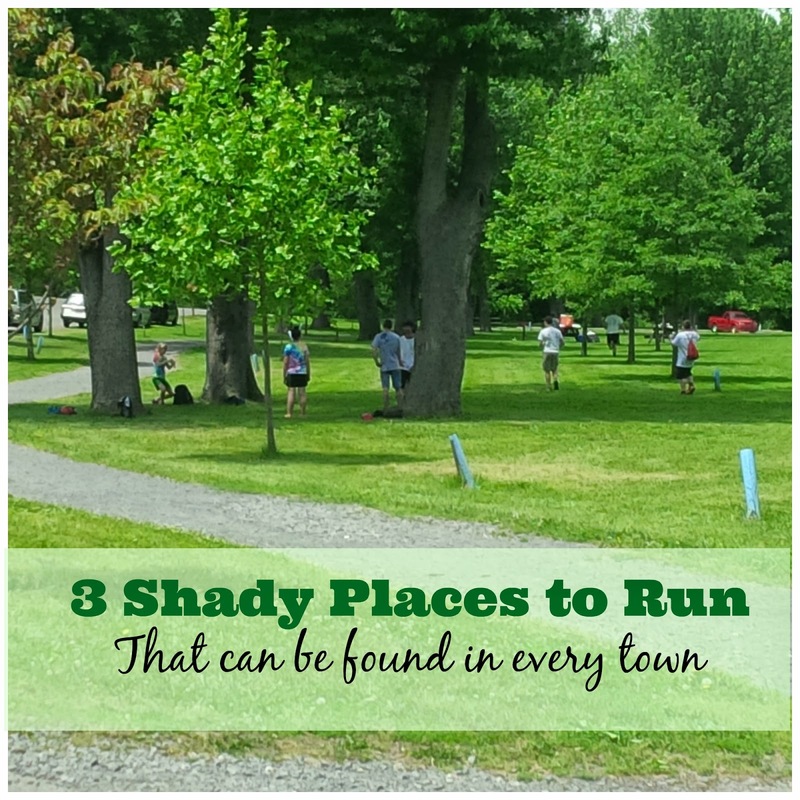 Now if you know me, you would know that sharing the roads with cars as I run scares me, I prefer to run on trails and sidewalks so finding some of these places took some thought. Some of these places I found last summer and I plan to take advantage of them this summer when it gets too hot. The best part is that I bet each of you have at least one, if not all of these places near your home! 1. The cemetery: I don't need to tell you why this is such a peaceful place to run. Cemeteries are usually shaded and there is no traffic. 2. College or University: These offer lots of paved paths. They are nice and shady and over the summer months the traffic is very slim. 3. Campgrounds: If you can find a campground to run in, you will be in shade heaven even if you run in the middle of the afternoon ( not that I would recommend that). The only negative thing I have found about running at a campground is that if I go early in the morning, I can still smell the campfires from the night before. Also, I would go during the week because they tend to be pretty busy on the weekends. And of course there is always the treadmill or an inside track but I prefer to be outside as much as I can during the summer. And don't forget the GIVEAWAY we have going on! If you hadn't enter it yet, go now! We had two very different weeks last week. I really got my workouts in while I took on some home/landscaping projects while Lacey went on vacation to a beautiful location (which I hope she tells us about later). I know my week may sound pretty boring as I am writing this all down, but believe me, I certainly wasn't bored while I was doing it! I spent a few days working on a little landscape project at my own house and then spent the rest of the week helping my parents on a bigger project. I can't wait till these projects are completed so I can post pictures. As far as running, I got a few one mile runs in and two 3.1 mile runs in. It's been really hot here during the day so i've been waiting till night to do my runs. One night I didn't run untill 8:20 pm ( it was still light out) and even after I ran 3.1 miles it was still 85 degrees! On Friday I decided to run earlier in the morning and it was actually a bit cooler. When I came home I push mowed our entire lawn and our neighbor's lawn (since they were on vacation and asked us to do it). Neither one of us has completely flat yards. I was about ready to die when I was done. I know I don't hydrate very well! I was feeling all accomplished that I got a run in and 2 lawns mowed and it was still eaarly in the day yet. Turns out I was so exhausted that I couldn't do anything else all day! Later that night I did go to a running shoe seminar and I actually learned a lot. I'll share some things with you all later! Did anyone else do a lot of yard work last week /weekend? Flip Belt and a Summer GIVEAWAY! Happy Friday everyone! These week just went entirely way to fast. June will be over before we know it! 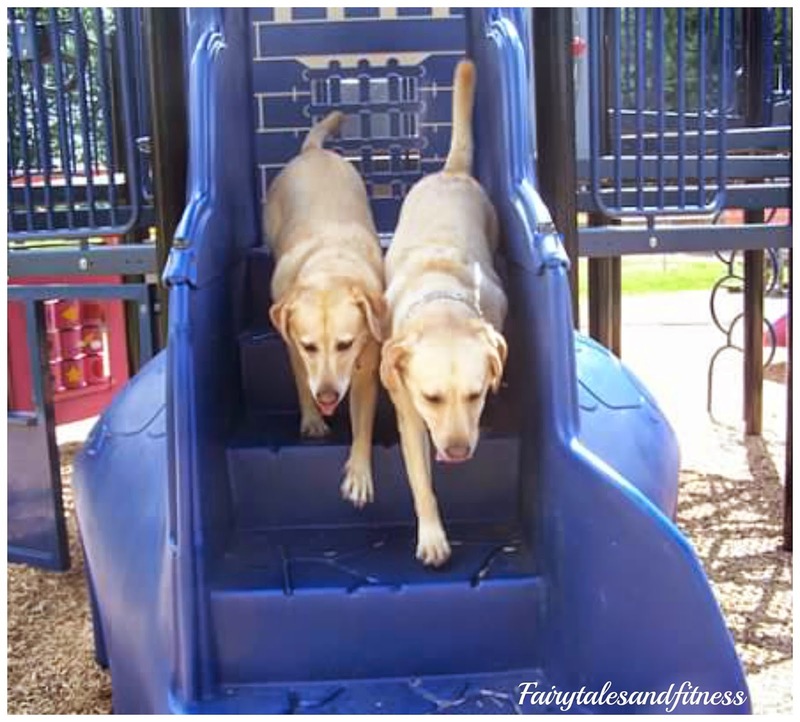 Today you are going to get Two perspectives (one from Lacey and one from Meranda) on the same product. 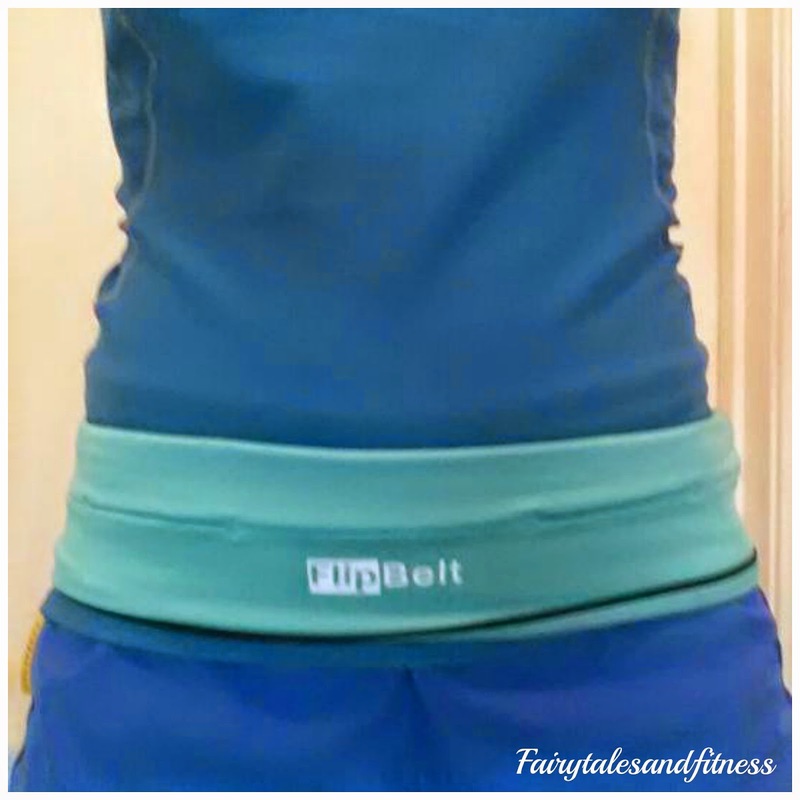 When I was at the Big Sur Marathon Expo back in April, I purchased a Flip Belt. I've heard many good things about this product prior to buying it. WE RUN DISNEY posted about this and I've been wanting to get one since then but I was afraid to order one not being able to try it on, just in case it wouldn't fit. So I was happy to see that they were at the Big Sur Expo. Here are our 5 thoughts! 1. I was debating between two sizes, and I ended up getting the bigger of the one. When I tried them on I put it over my jeans I was wearing and didn't think it would ride up too much, but I was wrong (guess I should've factored that in). I wish I would've gotten the smaller one instead. Even though it slid up a bit, it didn't bother me and it was still very comfortable. I like that it laid flat against you and it wasn't bulky at all. 2.This is the only race I had ever brought my phone with. Last year, I carried it the whole time. So this year I wanted to find something I could place it in, even with the otter box case on it. The phone fit perfectly in the belt, along with some GUs(guess I should've put all my GUs in there rather trying to put them in my arm sleeves). I'm not sure if you are suppose to keep it in the front on your stomach or around your back. I could feel it more on my front side so I turned it to my back and it didn't bother me at all DURING the race. However, after the race I was wondering why my lower back hurt so much. And that is the only thing I could think of that had to be. I guess it is true what they say, don't try anything new on race day. Maybe it would be great for smaller races, or even a half marathon. But it was too much pressure during the 4 hours for me. Maybe some people may have more tolerance than me. 5. I think this Flip Belt has become the modern day fanny pack. I haven't worn mine much yet, but I will consider wearing this on vacation (under my shirts of course). I am unlike many gals in the fact that I hate carrying purses. I like to leave the house with as little as possible. I could see myself wearing this belt to the Disney Parks and other day trips. It is so roomy that I can even fit my wallet in it. (after I put my shirt over the belt you couldn't even tell that I had it on.) After I put my wallet in it, I could still fit in my phone, some chap stick and a point and shoot camera and I still had room for more! I'm thinking I might start taking this to work with me when I have to go out on assignments. I can for sure fit my phone, camera, notepad and pen in here. 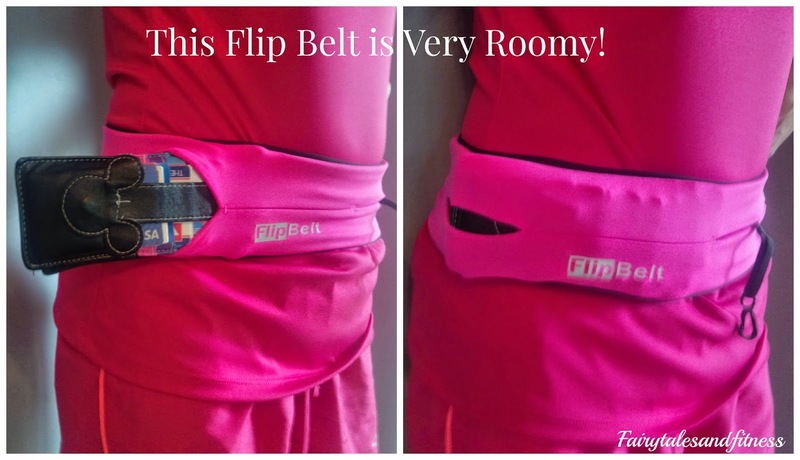 Heck, even if you aren't a runner, this belt has so many uses for anyone that has to carry stuff! I felt like a kangaroo! 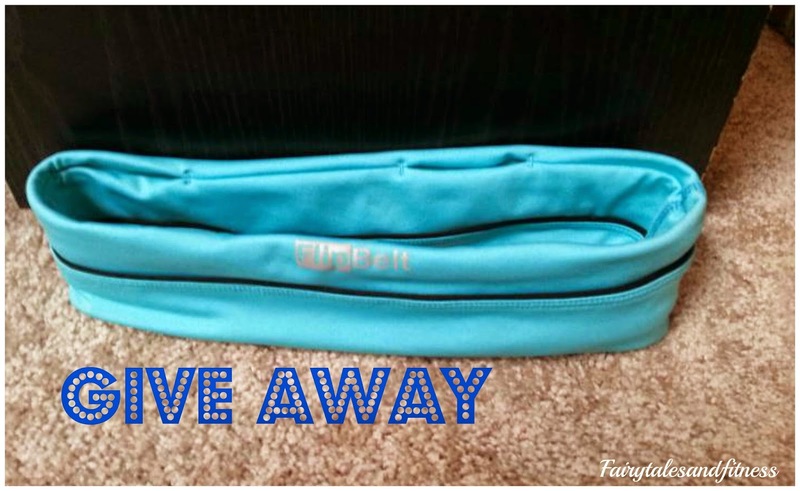 You can purchase your own FlipBelt at Flipbelt.com or you can enter our giveaway! So tell us, how do you currently carry your things while running? Confess, have you ever worn a fanny pack? Besides Co- Authoring this blog, I also author my own Fashion Column in a newspaper. It's called Fashionably Fit. 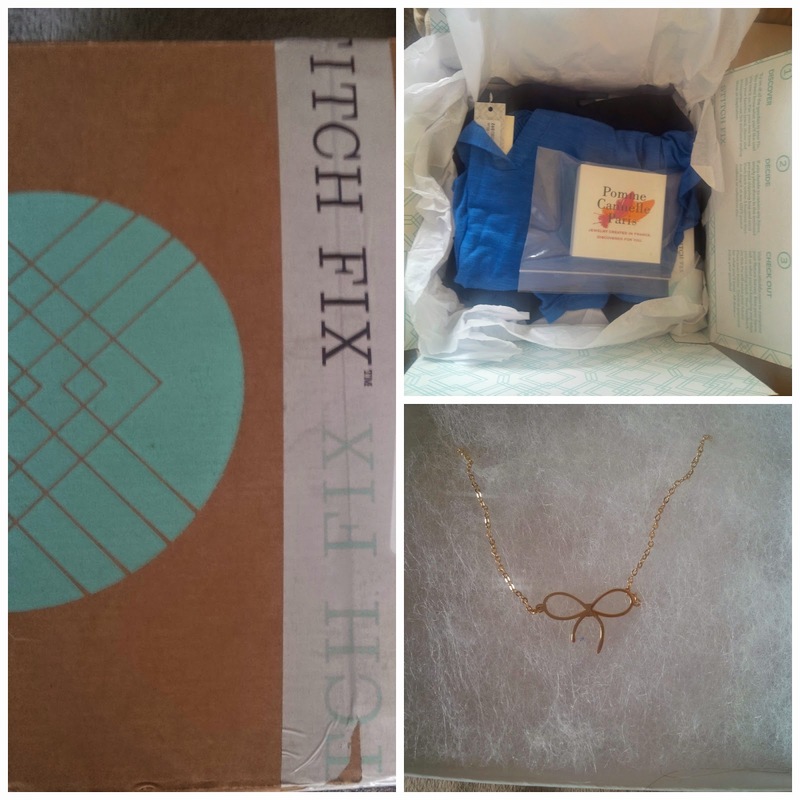 A few weeks I was sent a box of clothing and accessories from a company called Stitch Fix. If you have been reading blogs for more than a few months, I am sure you are familiar with the company because several bloggers have shared their goodies. 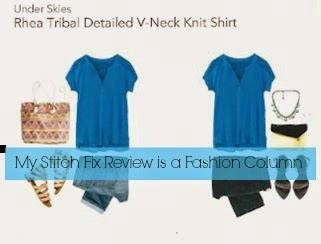 My column that week was about subscription clothing companies so I used Stitch Fix as my inspiration. I would share the link to my column but the newspaper has just switched to an online subscription basis so unless you are a subscriber, the only thing you will see is the title and the first sentence, not very exciting. So instead, I'm going to show you a video. I am opening up my Stitch Fix for the very first time. You are seeing my honest to goodness reaction to the items I've received. And don't worry, if you don't understand the concept behind Stitch Fix, I'll explain it in the video. Enjoy! Here is the gold necklace I mentioned in the video. And those pink jeans, well lets just say they made my legs look like sausage links! Not a good look for me. I forgot to mention in the video that there is a $20 styling fee for the Stitch Fix box. This $20 would go towards any one item in the box. My styling fee was waived compliments of Stitch Fix. Just in case you are interested, here is the break down of the actual cost of the items. My personal opinion was that these items were priced higher than what I wanted to spend on items that I didn't actually love or get to pick out on my own. Maybe I'm just cheap? I wish my box would have included a dress. Than I may have been willing to may a little more for had I liked it. So, how did I do for my first video? It's always a bit weird reading someone's words everyday and then actually getting to hear them speak. Do I sound like you thought I would? haha. I actually made the video back in May, but it took me this long to figure out how to upload it to the blog. ( I know it should seem simple, but when you don't have a Google Plus account other computer programs don't want to play nice with you). Have you ever signed up or subscription clothing? Do you have any tips for doing video on the blog? Which piece of clothing from my box could you see yourself wearing? 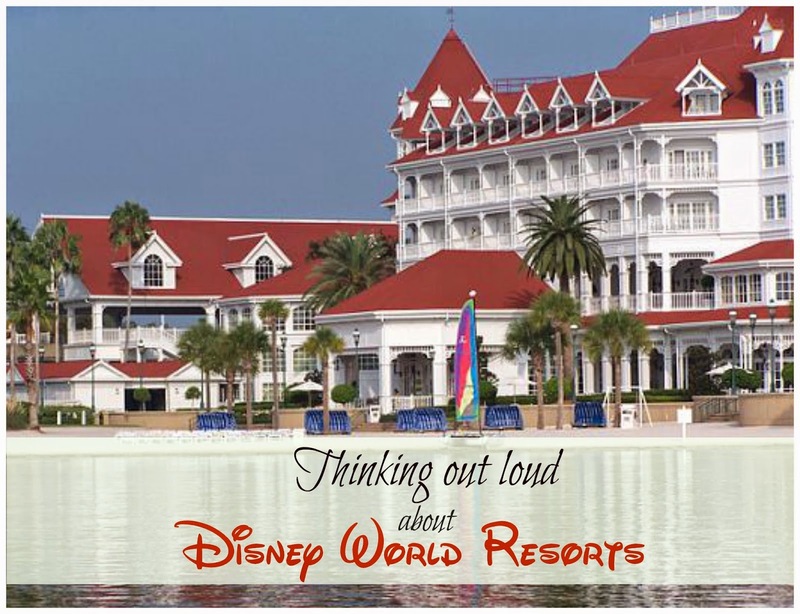 Today I'm Think Out Loud about Disney Resorts! 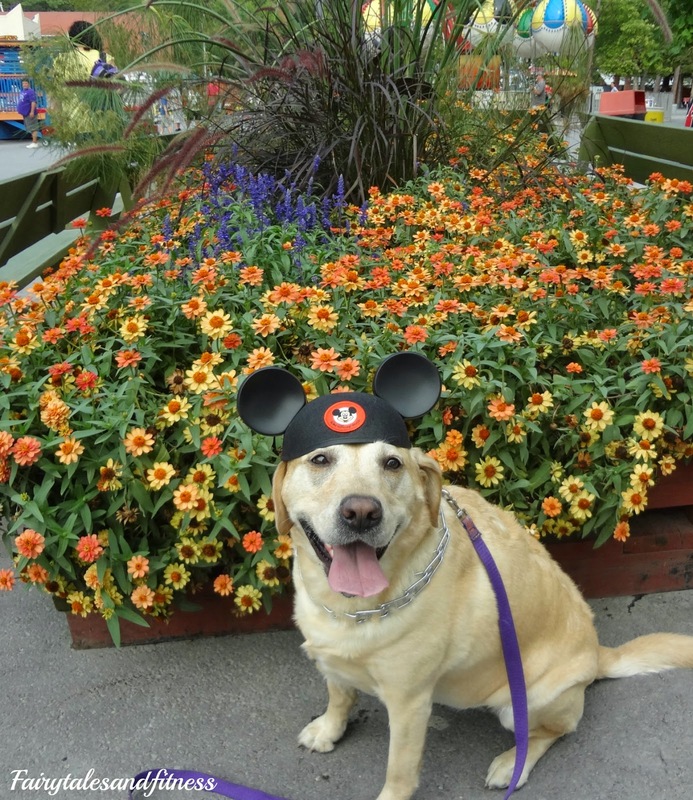 We kind of got off to a late start when booking our reservations for Disney's TOT weekend and here's why. Last year during Wine and Dine weekend Scott and I stayed part of the time at a Disney Resort and then the other half of the time ( after the race weekend) at the Wyndham Bonnet Creek Resort. I have never stayed off Disney property before and if you were to ask me to stay anywhere else other than a Disney resort I would pretty much refuse too. After all, staying at an official Disney Resort is part of the magic right? Well, last year Scott purchased some vacation points through Wyndham Vacation Club so we thought we would give it a try for a few days after the race. OMG, this place was fabulous! The Wyndham is a deluxe resort right on Disney property. Check out these views! I was worried that it wouldn't feel very Disney-ish. But what could be more Disney-ish than seeing a theme park and other resorts right from your room. I seriously think this is one of the best views I've had at Disney. You can actually see the Swan and Dolphin Resorts in the Background of this picture. Its the pink-ish and green building. You can see Hollywood Studios right in front and then over to the right is Expedition Everest from Animal Kingdom. A view of Pop Century. I think there was a view of a Disney park or hotel on every side of the Bonnet Creek Resort. In front is one of the Disney Golf Course. I did a brief post about this resort if you would like to see more pictures and find out why this resort is considered to be the only non-Disney resort on Disney property and why it is actually land-locked, with Disney property all around it. It really is quite an interesting story. So anyway, lets bring this post back to current day. We liked staying at the Wyndham so much that I thought we agreed that we would stay there again on our trip in the fall so I didn't bother booking a Disney reservation at the time we signed up for the race. Just last week Scott told me that he thought we would stay at a Disney Resort in the fall and save our vacation points for another time. WHAT???? Everybody knows that as soon as you sign up for a Disney race that it is smart to book your resort stay right away, especially if you have a certain place in mind. So needless to say, picking where we wanted to stay in the fall has been a little challenging. Generally I like to stay some place new each time, but sometimes we just end up going back to our old favorites. I remember from a previous conversation that Scott had mentioned something about the Wilderness Lodge. We've never been to Wilderness Lodge before so I thought that might be fun for this trip. But after further discussion, we both realized that we wanted to stay in the Boardwalk Resort Area. The only resort in that area we have been to before was the Boardwalk Inn. That's not necessarily my favorite. I don't like the fact that it doesn't offer any quick service dinning options right at the resort. 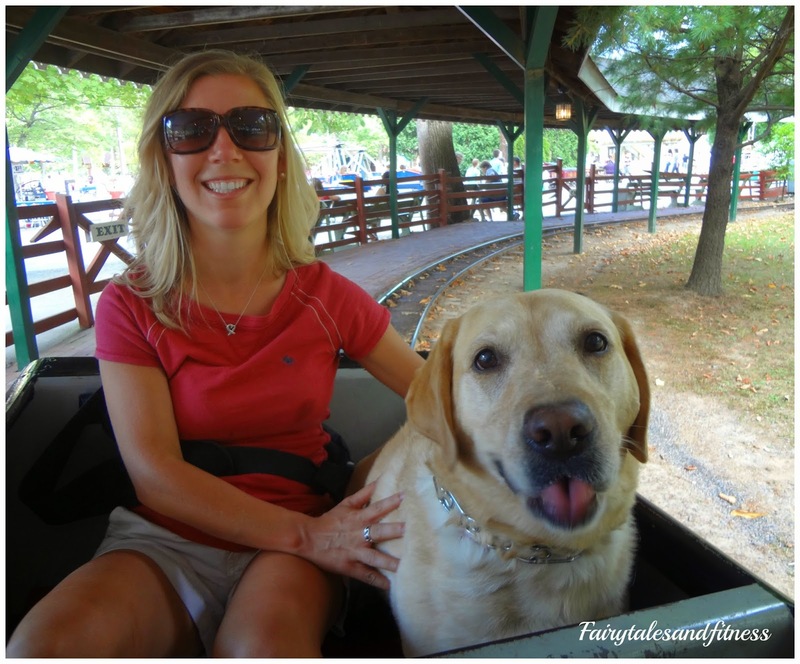 We thought maybe we would try the Villas, or Beach or Yacht Club. As expected, none were available for our dates. So we decided on Wilderness Lodge. I was still having some hesitations though. I admit I can't really judge a resort I have never been to before but WL seems a little "dark". When I think of a Disney Resort, I think of Sun and "Beachy" themed resorts. I then remembered about the Swan and Dolphin resorts. Although not owned by Disney, they are situated right along Crescent Lake in the Boardwalk area and offer all the benefits as a Disney resort. I checked and there is availability so I will now be switching our reservation to there. I'm actually really excited about staying at the Swan. I'm excited about being able to walk to so many of the attractions, HS, Epcot, Jellyrolls, Golf. And I love that there is a beach there for use and I like watching the swan boats go by. The Dolphin is just a few steps away and between both resorts there are some amazing dining options. I hope I'm not disappointed that I gave up WL for Swan. I don't think that I will be. So I know that a lot of people Love the Wilderness Lodge. Please don't tell me that I made a mistake,,,haha or tell me how much you LOVE WL. But If you have stayed at Swan/Dolphin or any resort/villa in the Boardwalk/Epcot area I'd love to hear about it. 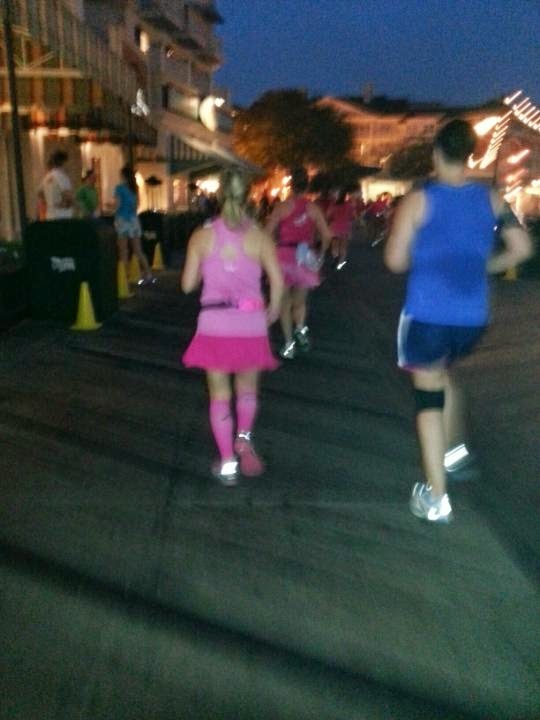 I have visited that resort area a few times and I loved running through there this year for the Enchanted 10K. If you have never been to a Disney Resort before, tell me what you look for in a vacation resort? Do you like to be secluded or in the thick of things? #Runner Problems: Who Can Help? A Peek at our Pop! Why Are These Foods Organic? And Another Winner.